Since I’ve owned guns I’ve lived in three states, so I have had the pleasure of holding Concealed Carry Permits in three very different states. The processes to obtain and renew those licenses are as varied as they come. I believe the Second Amendment guarantees to citizens the right to carry concealed firearms, and there should be no government regulation of that right for those citizens who can lawfully own a gun. But, living in the real world, we are forced to deal with the system we have. For those unfamiliar, there are basically three kinds of permit processes for concealed carry in the United States. The first is my favorite, so-called Constitutional Carry, and requires no permit. Vermont, Alaska, and Arizona currently have this system and a lot of others are considering it. For states that require a permit for carry, there are two kinds of processes, May Issue and Shall Issue. May Issue means the permitting authority May Issue you a license if they deem you are worthy, and usually if you can prove the need for the license. In Shall Issue states, the permitting authority Shall Issue your permit, unless they can prove you are not eligible for the license. It really comes down to the burden of proof: in May Issue states, the burden is on the applicant to prove the need, while in Shall Issue states the burden is on the issuer to prove the applicant is ineligible. When I first got a pistol, I lived in Alabama, which was and is a May Issue state. From what I know about other May Issue states, Alabama is the easiest to get permits. My experience was simple. I went to the Sheriff’s office in the county seat, and filled out an application, and paid $10. Five days later I got a call that my background check was clean, and I could come get my license. Although the permit was good for only a year, renewal of the license was much easier. I went back to the Sheriff’s office and filled out a renewal application, and the clerk looked up my name in her computer to be sure I hadn’t gotten in trouble in the past year. She then called into the other room and told the Sheriff that she had a renewal, and told him my name. The Sheriff stuck his head in the room, looked at me, and said “Yeah, he’s good.” I paid my $5 and was on my way. When I moved to Arkansas and wanted to get a permit there, I found a different situation. Arkansas is a Shall Issue state, and requires applicants to complete a training course, pay for fingerprints, and pay a $144 permit fee, that’s not refundable if the permit is denied. The permit is good for five years. At the time, I also had to list the serial numbers of no more than 5 guns that I would be carrying, which, to me, was de facto licensing of my guns. I got all the forms from the State Police office in my town, completed my training, paid to be fingerprinted, and mailed it all off. The law allows up to 120 days for the process to be completed, but six weeks later, I had my permit. Then five years later, I went through it all again. When I moved to Georgia, I found a process that was about in the middle. Georgia is a Shall Issue state. I got a money order for the permit fee and background check fee, and went to the county courthouse. The application was easy to complete, and fingerprinting was actually done by a scanner rather than the traditional ink and paper. Four weeks later I had my permit, although the law give them 60 days. Georgia’s permit is good for five years, and I realized recently that I’ve lived back here long enough to have to renew my permit for the second time. My, how time flies. Another interesting point here in Georgia is some changes that happened last year. For a long time, knives with blades over five inches were in a regulatory black hole. The law covered knives under five inches, but there was nothing about knives longer than that. The fix – a couple of sentences in a gun law passed in 2010. One changed the name of the Georgia Firearms License to the Georgia Weapons License, and another said that handguns and knives were weapons. Done. So, how do I feel now about these processes? I advocate Constitutional Carry in all 50 states and DC. In the era of instant computerized background information being available to law enforcement, the argument that it provides security to officers is no longer valid. It just remains a de facto tax on gun owners that should be ended. I know there are times, like when purchasing a gun, where having a permit makes the process quicker, because the permit holder has already been checked out, and there is an active record of that check. But, a gun owner could choose to pay for a voluntary NICS background check, and have proof of that handy when buying a gun. I would recommend training to anyone who is considering owning a gun for protection, regardless of whether you plan to carry concealed or not. But, I would not require that training as a condition of getting a permit. And now, if you’ll excuse me, I need to set a reminder to renew my permit this fall.
}}} 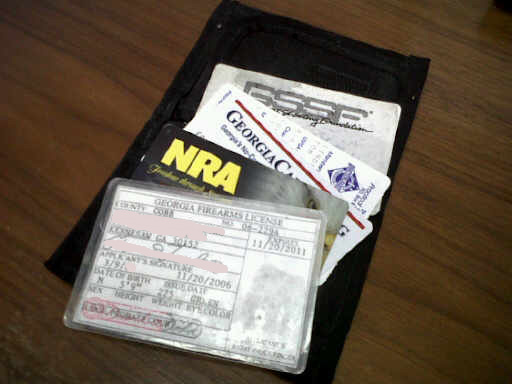 One changed the name of the Georgia Firearms License to the Georgia Weapons License, and another said that handguns and knives were weapons.